Director Sam (Evil Dead) Raimi brings Frank L. Baum’s magical world back to life for a whole new generation with Oz the Great and Powerful. 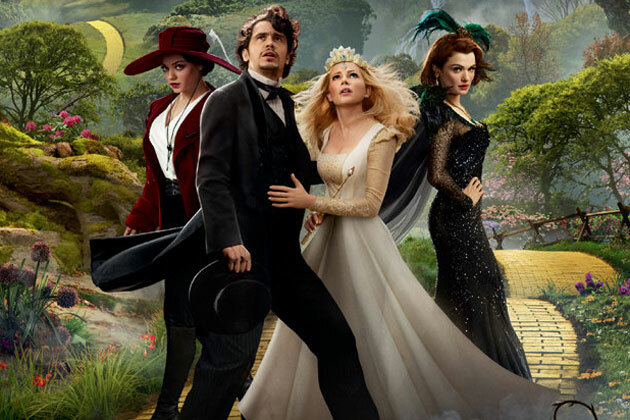 Starring James Franco, Mila Kunis, Rachel Weisz, Michelle Williams and Zach Braff, this new 3D fantasy from Disney is, in the words of Raimi, his ‘love poem’ to The Wizard of Oz (1939). Long before the good citizens of the Emerald City had ever heard of Dorothy, a two bit circus conman from Kansas named Oscar (Franco) finds himself transported to the kingdom of Oz by a freak tornado, and into the middle of a power struggle between three witches, Glinda (Williams), Theodora (Kunis) and Evanora (Weisz). Suddenly Oscar is being praised by the good people of Oz as the mythical wizard whose arrival was long foretold, and who they believe will become they’re new ruler. So, with the help of a talking monkey called Finley (voiced by Braff), and a tiny girl made from china (voiced by Joey King), it is up to Oscar to rescue the citizens of Oz, whilst along the way discovering the real man hidden within him. When people consider MGM’s original classic, it is the stars of the iconic film which they remember. Though countless technical artists left their mark on the film, it is Judy Garland, Frank Morgan, Billie Burke and Margaret Hamilton, who spring to mind. With Oz the Great and Powerful however, the tables are turned. The unspoken presence of director Raimi permeates every aspect of the film, and the influence of his largely fantasy based film repertoire is clearly felt in his latest production, with a heady concoction of cartoonish fantasy and homage-like references to the earlier classic, leavened with an undercurrent of subtle horror. The cast are suitably convincing, as you’d expect, with Franco, Weisz, Williams and Kunis giving it their all as the various magical rulers (both genuine, and perhaps not so much so) whilst Braff injects the obligatory comic relief in Finley. However, as Raimi is quoted as saying, it is the land of Oz in the end which is the film’s real star as it was in Baum’s books, giving Oz the Great and Powerful a timeless magic which will no doubt be entertaining audiences for as long as Judy Garland and her ruby slippers have.